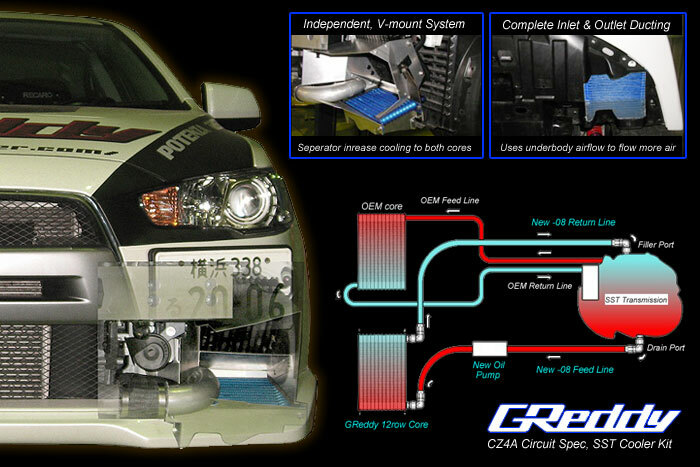 GReddy is proud to announce the production of some much need products for hard driving Evolution X, with two new Circuit Spec Cooler Kits. The V-mounted SST (MR –twin clutch transmission) and Engine Oil Coolers increase the efficiency of the OEM coolers, by increasing the fluid capacity and cooling surface area, while controlling and improving air-flow to the cores. The factory SST transmission found on Evolution X MR are known to trigger a “Safety” limp mode when the internal fluid hits 140C (284F,) which is not difficult to do during hard driving. 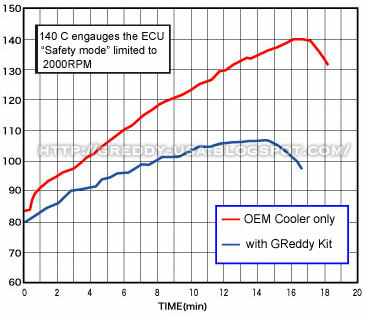 The GReddy SST Cooler Kit uses an additional independent system with it’s own compact 160l/hr pump for superior cooling. It is easily installed by connecting to the existing fluid “Filler” and “Drain” ports on the transmission case. (NO machining required.) The V-mount arrangement is mounted in the front left inner fender under the factory unit (and to fit it, it also includes a new aluminum I/C outlet piping.) Another benefit, is that vital areas, like the Radiator, are not covered. The kit also includes carefully designed Inlet and Splitter Ducting to evenly divide and control airflow through both the GReddy and OEM cores, while the Outlet Ducting helps increases flow. The V-mounted 12row (-08) GReddy core takes advantage of the airflow under the vehicle to draw out even more air through the core (,while the stock core has to fight with the air turbulence of the spinning wheel in the wheel well.) Also included are precise patterns for trimming of the under liner.